Posted January 23, 2018 · IdeaMaker for UM3? continue using the Raise3D-slicer "Idea Maker" with the UM3e? Anybody here did that already and can supply the needed settings for IdeaMaker & the UM3e? 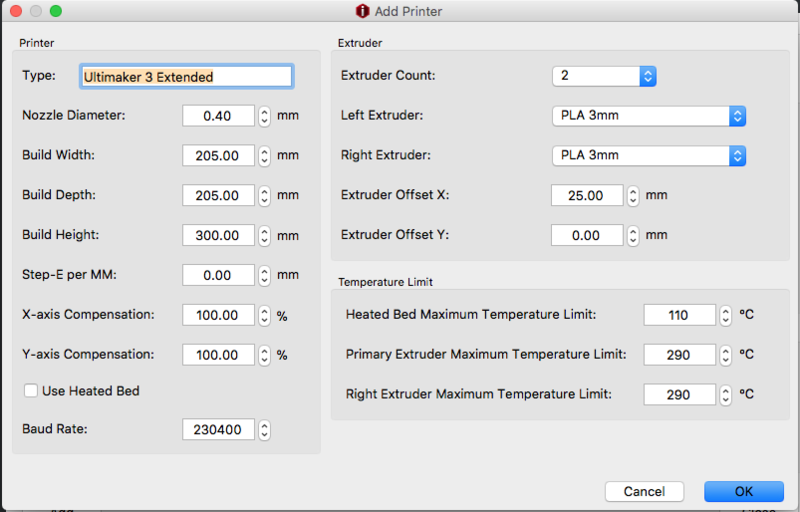 As there is a dialog to add a "custom" printer in IdeaMaker, it should be possible. Posted February 10, 2018 · IdeaMaker for UM3? Hello I've been trying at this too and I know I'm a little late but I may be able to help! Posted February 19, 2018 · IdeaMaker for UM3? So what are your settings, Yousef? Posted March 21, 2018 · IdeaMaker for UM3? Hi guys, I also need to know the initial settings for the UM3 in Ideamaker. Yousef (or anyone else) can you please help?